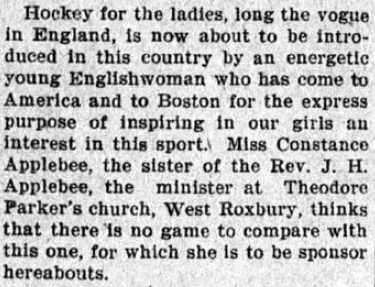 In the absence of any living witnesses to Constance Applebee’s introduction of field hockey to the United States in 1901, I find myself compulsively searching for as many contemporary accounts as I can possibly find. Sometimes I’m looking for specific facts, but other times I’m just blindly fishing in the hope that I’ll come across something I didn’t know before. This was the first I had heard of her having a brother at all, let alone in America. West Roxbury rang a bell, though, and soon I realized why. The student list printed by Harvard for their 1901 summer school session listed Applebee as hailing from “W. Roxbury,” which, coupled with the reference to her brother in the article above, led me to wonder if she was staying with him at the time. 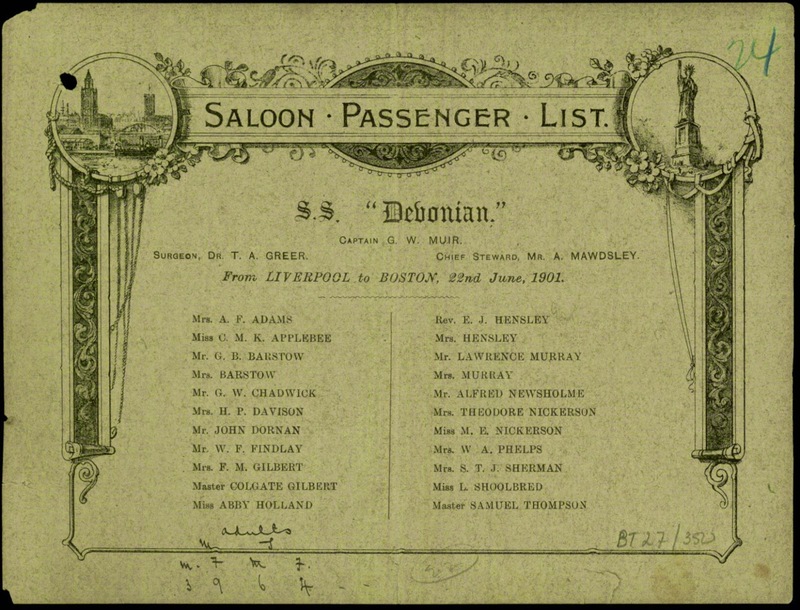 I found Constance Applebee’s name on a passenger list for the S. S. Devonian for its voyage from Liverpool to Boston in late June of 1901, so she hadn’t been in West Roxbury long if that was indeed where she was staying. I became more intrigued by the connection when I noticed the address for the secretary of the American Field Hockey Association in its 1901 publication “English Field Hockey for Men and Women,” which was written by Applebee, was listed as “23 Landseer St., W. Roxbury, Boston.” That address is less than half a mile from the Theodore Parker Church in West Roxbury, making a connection with her brother, who I later discovered was actually her half-brother from her father’s first marriage, even more likely. Which is a long way to go to say that I’m pretty sure I now know where Constance Applebee stayed, or at least what she used as her mailing address, when she was in Massachusetts in 1901. Posted on March 17, 2015 March 17, 2016 by Eric MeanyTagged Constance Applebee, Harvard, John Henry Applebee.